People have always shared opinions about products, businesses and services. However, these conversations have never been as frequent, passionate or as public as they are today. Marketing research shows that up to 90% of consumers read reviews online before a purchase – and up to 88% of them trust the reviews as much as a personal recommendation made by someone they know. The first step to take is to control where and how these conversations happen. Instead of waiting for clients to find an outlet to speak about your brand, create opportunities for this to happen. Use surveys, forums and social software and platforms to encourage these conversations where you can control them and moderate the discussion. An advantage of this approach is that you can move the conversations with difficult customers to a one-on-one format (by email, or even phone). This is a great way to deal with a customer who has had a frustrating experience with your brand – and can turn his harmful words about your brand into a great story about how your company takes good care of its customers. 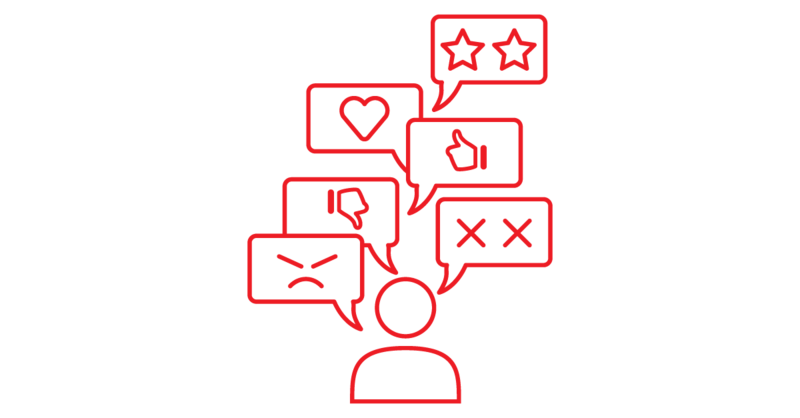 You can also maximize positive outcomes by turning positive customers into brand heroes by engaging them with surveys and personalized follow-ups. Quotes and impressions from these conversations can then be used in various marketing tools to build brand trust. They can frame the discussion around your products and get customers and potential customers thinking about what you’re selling in the right way from the get-go. Read more here about how LaunchLeap can help you start quality discussions with your clients.